Now we know where all that beet juice came from. Somehow, these little dehydrated beet chips—or "crisps," you know, in case you speak British—are almost as beety as their juicy counterpart, yet much more palatable to me. 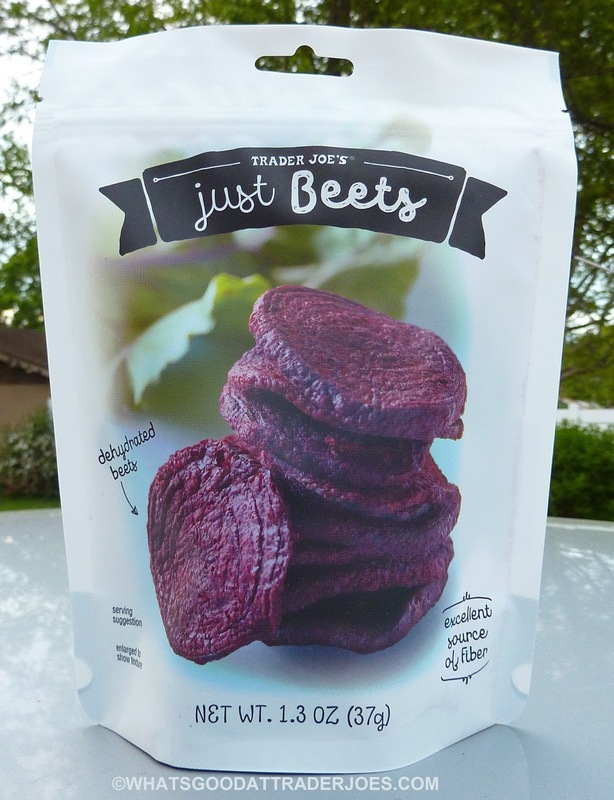 In fact, I'd rather eat these chips than regular beets—and if you didn't read the beet juice review, I mentioned that I feel pretty neutral about normal beets. So, I guess you could say my feelings about these chips are somewhat positive. I like the lack of sliminess. I love the texture of chips—and that's exactly what these feel like: thin, kettle-cooked potato chips, with maybe a hint of a baked potato chip type feel, a la Stax or Pringles. Mind you, they taste nothing like that. They taste just like beets. So I feel pretty indifferent about the flavor. But the nice texture puts my overall feelings just slightly better than neutral. But I could never be as positive about them as my wife is. Again, just for review, she's a big beet fan. 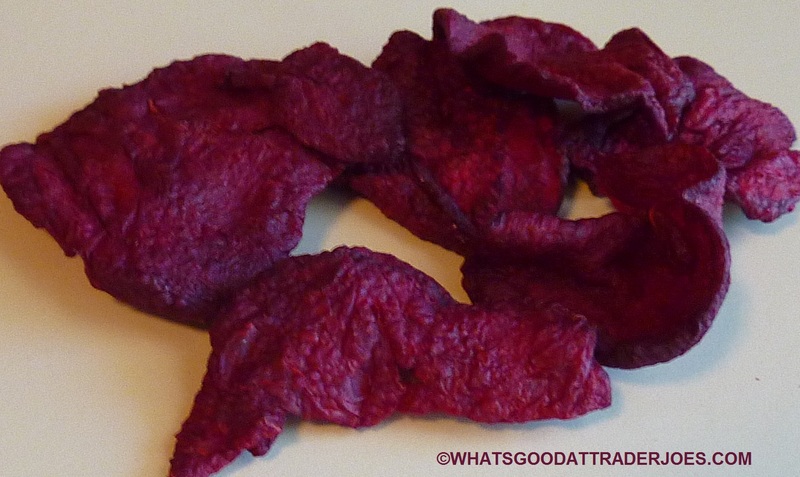 Loving the flavor of beets and the texture of chips, Sonia says this product is one of her favorite new foods so far this year. Some of her earthy, health-food-loving friends appreciated them as much as she did. I can't imagine these will be universally popular, especially among junk-food-lovers, but they'll undoubtedly find a crowd that appreciates them way more than I do. And Sonia insisted that I point out the fact that the entire bag has only 140 calories and half a gram of fat. Plus, there's only one ingredient: just beets—how appropriate. Three stars from me. An enthusiastic four and a half from Sonia. Dude!, u are on a beet kick, eh? Well, more Sonia than me...but yeah. Apparently there are beet desserts out there...but I wouldn't be eager to try any of them! I make my own best chips but these would beat lot more convenient! I'll check Em out. Thanks! Wonder why they don't use organic beets? They are plentiful and reasonable. Thanks Nathan! Even though I already went to TJ's TWICE this week (lol) I'm going to take another trip tonight and pick me up some of these beet chips and some uncured bacon jam that I saw on TJ's website. I loved Terra's chips but not their price, so I'll pick up some parsnip chips and beet chips from TJ's and make my own mix! Maybe some of the plaintain chips as well (my favorite!) I have a request for your future blog posts: Can you please include the ingredients in the pictures you take as well? (They're usually a little bit cut off at the top, since you focus on the the nutritional panel.) The reason this came to my mind is that I wanted to make the Coconut floes that TJ's had discontinued a couple of years ago, and went to your blog post to search for it. I found that you had indeed reviewed the coconut floes, but alas, your picture cut off the ingredients- I was checking to see where on the list TJ's had xanthan gum, if they used it. I wanted to get an idea as to how much xanthan gum I should use, since my floes still came out rather crystal-ridden. *I do want to correct my comment: You photos do often include all of the ingredients, but sometimes the ingredients are either on another part of the label, or they're too long and don't get completely included in your photo. =) Thank you for being great about taking photos, by the way.